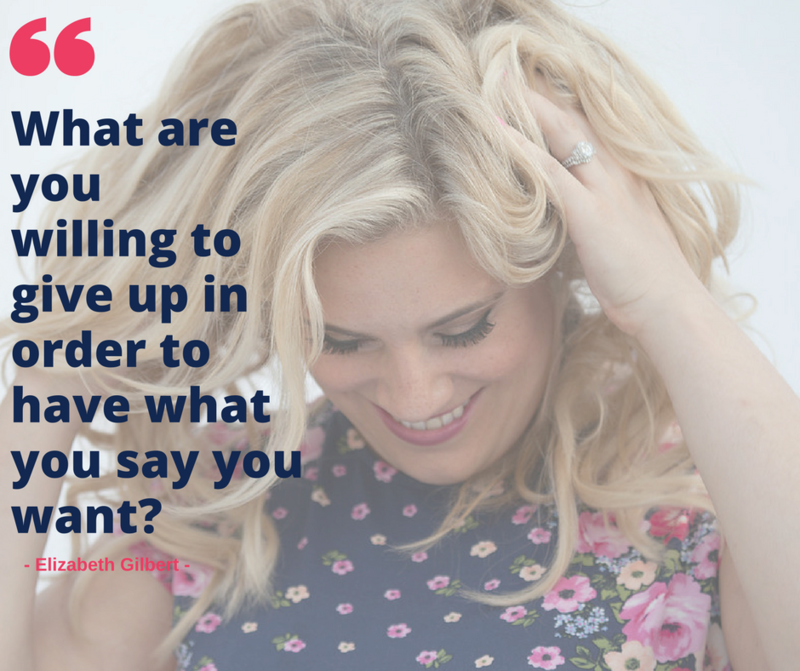 What are you willing to give up in order to have what you say you want? I first discussed this quote with some of you on an Instagram post, but the response was so mighty, and the tidal wave of emails I received about it so passionate, that I knew I had to bring the conversation over to the blog so that it gets the moment it deserves. The truth is, the second I read these words first spoken by Elizabeth Gilbert, I knew I had to talk about them with you. I knew I had to expand on them, and share why they resonated so much with me. I wanted to pause and tell you why I believe these words are so true, and why I know that only when you actually sit with their message and truly acknowledge the things that YOU yourself need to give up, only then will you begin to move closer to the things you say you want personally and professionally. 1️⃣ Worrying about what everyone else thinks about you and what you’re creating. Every time you turn your head to listen to what they have to say you are turning away from your goals and dreams. 2️⃣ The need to feel comfortable and fearless. That’s a recipe for never living your biggest, most badass, unleashed and fully gratifying life. I feel uncomfortable at some point every day, and even though that isn’t always easy (I must resist running from discomfort on a daily basis), trust me I know it’s always good for me. I focus on being courageous not on being fearless. 3️⃣ Negative self-talk that leads to analysis paralysis & a lack of forward movement. Say kind things to yourself every morning – I’m not joking! When was last time you look yourself in the mirror and recounted some of the praiseworthy things you have done? Develop affirmations and mantras that fill you with pride and self-love. Once you get the inside working, the outside will work a lot better! Need to borrow some until you develop your own? Here you go, take mine HERE! 4️⃣ Let go of people in your life who don’t “water your garden” as my dad would say. Surround yourself with people who make you feel inspired, courageous, and who show you through the way they live their life that they are also trying to turn themselves into the kind of person who is willing to grow and evolve to live their own best life – even when that takes work. Work on that growth together! 5️⃣ Stop waiting for everything to be “just right” or already ready to begin. As the great Tina Fey once said, “just say yes and figure it out afterward.” Nearly every awesome professional accomplishment I have under my belt was born in a moment when I ask myself: “can I really do this?, I’m not sure, but I’m going to try my best anyways!” True story – I can still feel all those anxious and nervous (and excited!) feels I’ve experienced that preceded every great business moment! Want a safe place to talk about things like this amongst other business owners and entrepreneurs? Be sure you’re in my Facebook community, and you’ll find hundreds of people talking about PR, success-based mindsets, and more! 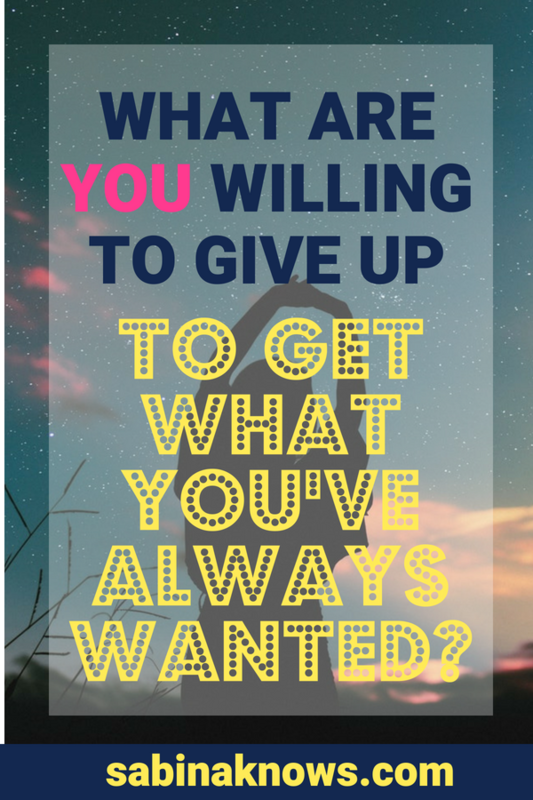 I want to hear from YOU, what have you had to give up in order to move closer to what you truly want – and who you truly are!